So you want to impress people with your brilliance? Wanna beat those nerds at their own game? Live happily ever after? 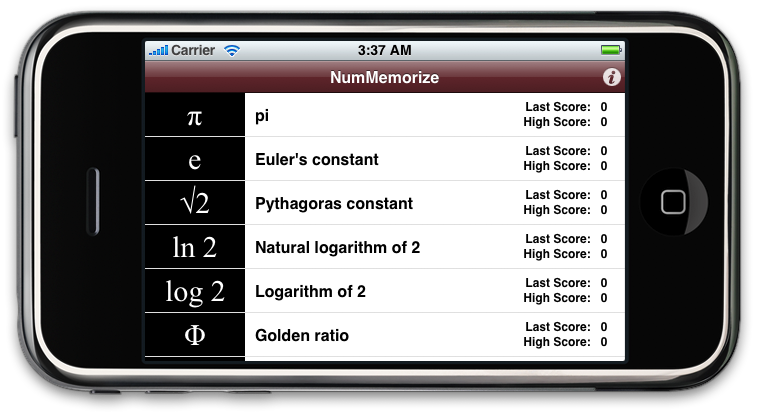 OK, NumMemorize may not be able to directly help you with the latter, but it sure can help for the former. When I was a kid, I was really impressed when a friend of mine told me he could recite pi to 15 digits. I thought that meant he was some sort of genius… One day I realized that I already knew pi was 3.1415, and that’s 5 digits right there. How hard would it be to learn another 10? Somewhere I found a listing of π to 30 digits. I realized almost immediately that without even trying I had committed two more digits to my memory. In less than an hour I had over ten digits memorized. Each morning, on the way to school, I would add two more digits to my scrap of paper, and would recite π from memory as I waited for the school bus. Pretty soon, I was at over 30 digits. A few days later, my friend boasted to a crowd that he knew 15 digits of π. I casually responded that I knew the next 15. Talk about looking smart! I instantly moved to the head of the nerd pack. After that, kids started asking me to help them with their math homework and telling their parents that I must be a genius since I knew pi to 30 digits! While practice is the single most important way to learn anything, another important factor is having a patient, and tireless trainer. That’s where NumMemorize comes in. Adults and children alike will love this app! Just like crossword puzzles and Sudoku keep your brain sharp, memorizing strings of numbers can keep you sharp as well. Like many things in life, practice makes perfect. Memorizing things, like numbers, isn’t that difficult – ask any baseball fan to recite you some stats, and you’ll get the equivalent of 30 digits of π. Fortunately, reciting 30 digits of π seems more impressive (intellectually) than reciting dozens of player stats. Of course, sports stats change all the time (but for the few), and mathematical and scientific constants are timeless, universal, and much more useful in huge number of careers, from construction to engineering to graphic arts to animation to banking to finance and entertainment to, yes, even sports. Hopefully, as you memorize these numbers, you will also take the time to understand what they stand for and their significance. You can get NumMemorize from the Apple iTunes Store. (Yes, it is only available for iPhones and iPod Touches) – Buy it now! There’s also a lite version available. Using NumMemorize is easy. Tap on its icon(seen here on the left) on the iPhone, to launch it. Initially, the view is in “quiz” mode. It is expecting you to start tapping out as much of a constant as you can recall. It won’t help you until it is clear that you need some help. Once you tap the first number, you have up to 5 seconds to tap out the next digit. After that time, the buzzer sounds and quiz mode ends. Additionally, you can mistap 3 times (for example, if you press a key adjacent to the key you meant to press) before the buzzer sounds and quiz mode is ended. See how many digits you successfully entered, by checking your score, and then let the app teach you the next digits. The app teaches yo uthe next digit by highlighting the next digit on the tap pad. If you press that number, you will then be shown the next digit and so on. Initially try to earn only two or three more digits at a time, until you figure out how best you memorize. Some people like to memorize digits in groups of two or three, and some pick larger groups such as five digits at a time. Experiment. Do this a few times a day to test the latest additions and to memorize more digits. And do let us know how well you’re doing and what works best for you. We would love to incorporate methods that’ll make NumMemorize help you even more. We’d love to hear from you so keep those emails and suggestions coming. Or feel free to leave us a comment below!! For God’s sake, why did you use a phone keypad instead of a calculator keypad??? So what if I learn it has a graphical pattern? I use a calculator keypad and Pi and conversions of metric to english almost every day. I don’t do it on a telephone keypad. Please give me the option of which keypad I want to use. For phone numbers your keypad is the one to use but for scientific constants…I don’t think so. You are onto a good thing here. I bought the iTouch app but the keypad makes me crazy. 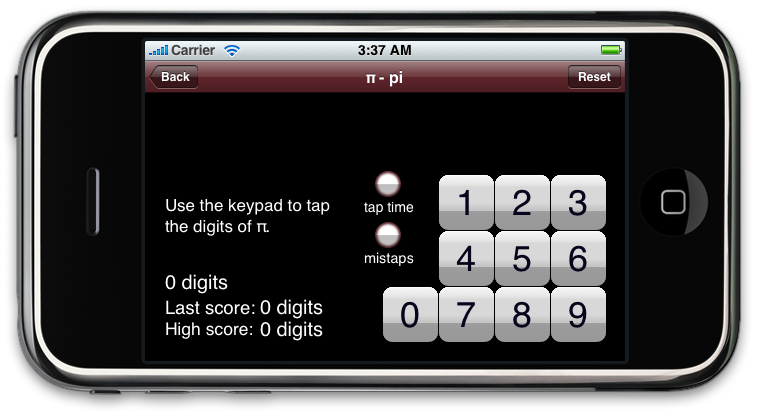 I memorized pi as a keypad pattern before handheld calculators since I had to do it so often and quickly. Any particular keypad layout you use? A digital photo would be nice. Or check out PCalc (free) to see the different number layouts they provide. Adding a couple of number pad options would be a good idea. You’d impress them more if you tapped out 50+ digits! Actually, being able to tap out the number of feet in a meter to eight or twelve figures into a Casio, HP 48g, or TI 83 keypad would impress as well as help on day to day operations. Okay, I checked out pcalc lite. That keypad layout would be fine. You know 789 on top then 456, 123, then zero and the decimal in the first two positions of the last row. Now if we are memorizing phone numbers we should have a phone keypad layout.